Lifeline® Normal Human CD 34+ Hematopoietic Stem Cells (HHSC-CD34+) provide an ideal culture model for the study of hematopoiesis. HHSC-CD34+ consist of several cell types including T cells, B cells, and monocytes. Lifeline® HHSC-CD34+ are pluripotent stem cells that give rise to all cell types in blood. These stem cells are typically found in the bone marrow and they compose less than 1% of nucleated cells in the blood. The CD34+ cells we provide are from this rare population of circulating stem cells. They are derived from healthy normal donors and are checked for viability and purity. 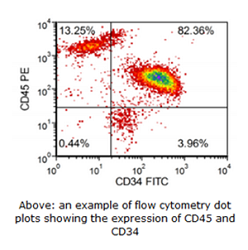 Our HHSC-CD34+ are quality tested via flow cytometry to ensure proper expression of multiple markers including positive expression of CD34 and CD45 and negative expression of lineage specific markers such as CD3, CD19, CD14 and CD56. Lifeline Cell Technology manufactures products using the highest quality raw materials and incorporates extensive quality assurance in every production run. Exacting standards and production procedures ensure consistent performance.